Products made from significant amounts of recycled material with high percentages of post consumer recycled content that can be recycled in most community curbside recycling programs are a sustainable, ‘closed loop’ packaging product. Products that cannot be recycled in most community curbside recycling programs have a significantly reduced value as a sustainable packaging product. Stock and custom printed natural kraft and white kraft paper shopping bags produced in the U.S. and Canada. Stock and custom printed natural kraft and white gloss gift and apparel boxes(no foil stamping). Stock and custom printed natural kraft paper merchandise bags and custom printed white kraft merchandise bags. Custom printed and stock natural kraft, white and colored wrapping tissue. 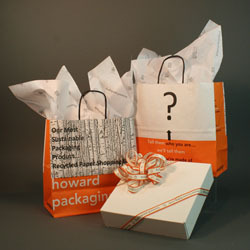 All sizes and paper grades of stock and custom printed paper shopping bags. All stock and custom printed paper merchandise bags. All stock gift, apparel and jewelry boxes. Most custom set up and custom folding cartons. All sizes and colors of stock and custom printed wrapping tissue. Custom printed plastic patch handle and die cut handle merchandise bags. Custom printed paper SOS grocery style bags. All paper grades and widths of stock and custom printed gift wrap. All products sold by Howard Packaging comply with the Model Toxics in Packaging Legislation regarding the presence of heavy metals in packaging products. Certificates of Compliance are on file in our office. Reusable bags made from Non-Woven or Woven Polypropylene(often referred to as ‘cloth bags). Reusable bags made from reclaimed, virgin or organic cotton. Bags and boxes with foil stamping, laminations, grommets, and leather or plastic handles. Most ribbon products(because the base material can’t be identified during the sorting process). ‘Thin’ HDPE and LDPE plastic bags. If you’d like to know how the Sustainable Packaging Coalition defines sustainable packaging, click on the link below.